Jungle Red Writers: Get your handbag at the liquor store? HALLIE EPHRON: Recently my friend Pat Kennedy sent me a quote from something Gillian Flynn (Gone Girl) said in Elle about how her personal aesthetic sometimes involves some odd fashion choices. Her comment also got me thinking about handbags. Was there ever a time when I didn't carry one? I have photos of me at 6 wearing a patent leather shoulder bag. My granddaughter at one and a half runs around the house with an old handbag looped around her neck. In my 20s I carried around a purse made of crocheted squares -- they were a supposed to be a bedspread but I lost interest and turned them into a purse. You could do that in the 60s. For a while (shh, don't tell anyone), I wore a fanny pack. And back when I wore pantsuits I also carried a briefcase and dispensed altogether with a purse. A particularly bleak period. But I think Gillian Flynn is onto something. Truly the handbag you wear is a window to your soul. Yes, your personal aesthetic. Or at the very least a tip-off to your age. Right now I favor Baggallinis. Small, light, washable, practical. Zippers! Lucy's got them, too. Our friend Pat has a formidable collection of them, too, but ever since her granddaughter proclaimed one of them "tragic" we have both felt unsure of them as a fashion choice. But when I go to the store to find something less tragic to replace it, I'm stumped. I'm sorry, I do not get why anyone needs to wear a big honking handbag? Like this bag, which I love (red leather!) but it's gi-normous, undoubtedly weighs a ton, and costs $600. Which, in the realm of handbags, these days isn't all that much. And who needs to carry around a file cabinet? What does your handbag (the one you're carrying RIGHT NOW (or just put down)) say about you?) What's the weirdest thing you've ever used to carry around your stuff? And what is the male analogue of a handbag?? Several years ago I happened across a vintage Lucite purse. Instant happiness; I now have several. While my "dressy" purse has a lovely carved top, my everyday one is not so fancy; it's a train case style from France, circa 1950. Works great for me and even earns a "what a neat purse" comment every once in a while . . . .
Fot the last year and a half-- until this Christmas-- I carried a little denim/vynel shoulderbag, just about six inches by six inches by three inches, with several built-in compartments and slits, which was quite adequate (except for the receipts and the grocery coupons, which I had to keep weeding out). I had to borrow an especially small nylon wallet from a travel bag, because no larger one would fit into that purse. I would have liked about one extra inch, but otherwise the purse was quite adequate, and too innocuous to make a fashion statement for good or ill. This year, my sister gave me a green (my color) ostrich (real? fake?) zipper wallet, very nice but too large for that minipurse. With $40 in "Kohl's cash," I acquired the kind of purse one can carry in a city like New York-- heavy rolled strap (impossible to cut quickly with a knife), just long enough to fit over the shoulder of even my winter car coat so that the bag could nestle under my arm, protected from purse snatchers by my elbow (yes, my formative years were spent in NYC. Half a century of that stance, by the way, has given me scoliosis). The new purse's strap is attached with large brass rings (impossible to rip out) and it has an outer slit pocket for the mail I have to drop off or the bills I'm on my way to pay. There's another outer zipper pocket on the other side, big enough for a ton of coupons, and that new wallet can nestle deep down in the bottom of it (hard for a pickpocket to reach). The handbag I miss, though, was satchel-style (originally dark green suede, but it became an unidentifiable sort of brown over the years). I carried it through most of college and law school. It had two heavy leather straps that wrapped all the way around it and continued upward for that underarm fit. It looked average size, even small, from the outside, but it once doubled as an overnight bag, and I was able to stash a folded twin size bed sheet in it as well as my overnight gear. Alas, it was fine for a student, but not so classy for a practicing lawyer. But I wish I'd kept it and found someone to duplicate it in a more reputable-looking material. My mom's last purse, a capacious structured bag with a needlepoint outer surface, is hanging on a hook in my basement. I keep meaning to take it to Goodwill, but I can't bring myself to do it. This Christmas was like the last, the one before, and the one before that: My wife gifted me a new wallet. Black leather. With slots for cash, credit cards and a window for my driver's license. And despite the fancy designer name, they all fall apart in a year so it's a very practical and appreciated gift. Thanks Honey. But wallets are so boring!!!!!! I'm going out this morning and getting a wine sack. Right now I carry a small black nylon purse - yes, with zippers! It's special because it was my late mother's and just like her - modest, simple, enough. But for many years I carried a larger leather bag made by artisans in Niger, with strips of woven cloth added to the outside. Definitely one-of-a-kind, never wore out, and big enough to stick a book into. I'll go back to it one of these days. I loved a colorful Nepalese bag I carried long ago, and of course had the obligatory macrame bag in college. And, yes, for a short period, a fanny pack - but it was in red leather, so maybe that redeemed it a bit? Do it, Jack! No one will ever know it's your man purse. SO my purse was feeling really heavy one day..and I thought-this is RIDICULOUS. What am I carrying? I dug around (red and black leather Chloe bag) and found: a full water bottle. Sheesh. My bag was so big, I didn't even know the bottle was there. I lifted the purse again, and it was STILL heavy. Huh. Dug around again. Another water bottle. when I'm at home, my mother's vintage navy coach shoulder bag, which snugly fits under my arm. Like me, just goes forever. for travel, a cross body shoulder bag with all the attributes Ellen mentions. best handbag story: my daughter's cute white vinyl bag printed with cherries we found at a consignment shop for $8. We were later told it was a genuine Kate Spade. Who knew? Baggalinis large enough to hold my iPad for most activities. Cargo pants that hold the essentials are great for a hands free options at events that ban parcels of a y kind. Still trying to figure out how men tote everything they need in pockets. Jack Getze, you CRACK ME UP! I used to do that to my husband...but with bedroom slippers. Now I make him candy and call it a day. Hank - Cracking up again! TWO bottles of water? My bag is so small I'd be surprised if there were a lip gloss (!) in there I didn't' know about. Oh, Sandie - I'm afraid cargo pants are right up there with fanny packs. "Tragic" as Pat's granddaughter would ay. And lumpy. Still, so practical and pretty much mugger proof. I carry a winter purse -- muted red leather (real?) by THE SAK. I bought it three years ago at Lord and Taylor (on sale). 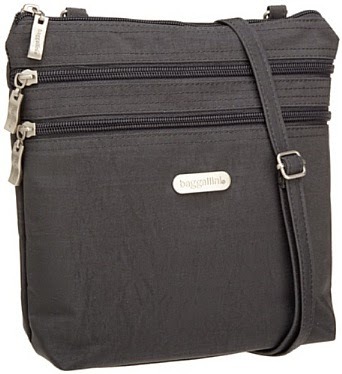 It's about 12 inches square with an adjustable strap and it has several compartments. One of my purse issues is that I empty it out every night -- throw away scraps of paper and tissues. In summer (stretch that season forward into spring and late into fall) I use the pockets of my capri pants. I have a small wallet in which I only carry one credit card, some cash, and my drivers' license. Denise Ann, you're a woman after my own heart. We haven't talked wallets, but MINE has got at least 30 cards stuck in it and weighs more than my purse. For a while I dispensed with a wallet and used a tiny change purse for money and rubberbanded the cards together. Ellen, isn't it weird the things one can't throw out? I've still got my mother's reading glasses. Now I wish I had one of her purses. For decades, I used the Small Carryall from Mountain Equipment Co-op (Canada's fabulous camping and outdoors store). Two years ago I switched to the Large Carryall when I got an iPod and things got really crowded in there. It is supremely practical and inexpensive and lasts forever. It is filled with pockets and compartments. It has saved me a fortune by not replacing it more than once every two decades. It's black. It has no style, so it's never out of style. At one point, so many of my friends had one, we always had to make sure we had our own purses as we were leaving. For years I carried around a big, bright green leather purse. Matched nothing. I could have survived a week on the TicTacs, Luden's cough drops, drug store cashews, Oreos six-packs, and Hershey's kisses that had sunk to the bottom. I had a big red multi-pocketed wallet and a makeup bag that were easy to find, and a roll of pens/pencils held together with a rubber band. I loved that bag. Then I got an iPhone and I could never find it when I needed it because there was no pocket for it. Now I carry a teeny black and white polka dotted bag. Inside: small wallet, lipstick, mirror, phone, tissue, and one emergency cough drop. I'm embarrassed to admit I am a purse-aholic. I am about bags the way many women are about shoes. And I can't help it. Big leather bags - black, brown, red, pink, yellow, turquoise . 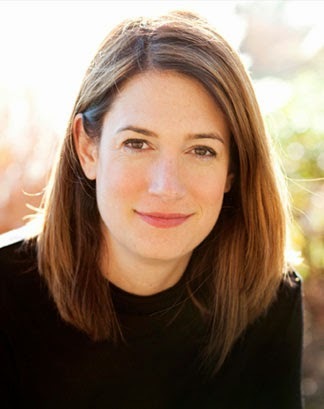 . .
Gillian Flynn is indeed a real person -- evidently kind of a ditzy one. She was a featured speaker at the Key West Literary Seminar in January 2014. She apologized to the audience the first day she was there because she only had one suitable outfit for the entire four days. "I packed mostly winter things. I couldn't believe that it would actually be warm here." Duh. But gosh, she's doing something right and with all those millions she must have now doncha think she would have gone out and bought a few things to wear. There are hundreds of sundress, tee-shirt and shorts shops on this island. She could even have bought a nice straw bag to accessorize with. And sandals, for goodness sake...not those clunky clogs she wore. But still, she was charmingly real -- and a great speaker too. So what's more important? The clogs or the content? Oh Kaye, that's my secret vice, too, the purse department at TJ Maxx. They also put the Baggallini's on sale for about $20. Susan D, went right over and checked out that Carryall. Perfect! Ramona, smart to have one with polka dots. It's too easy these days to pick up the wrong bag. Clogs and a wine bag. I love her! Thanks, Pat! Denise -- Only one credit card means you are missing out on many deals and discounts. Simplicity has a price. OMG, where would I be without my AP, Home Depot, and Walgreen's discount credit cards? Hallie -- My feet are freezing right this minute! Think your hubby would trade last year's slippers for my last year's wallet? Heck, I'd give him the new one. These old athletic socks I'm wearing are tragic. I've never been one to spend a lot of money on handbags. I do like to have a lot of pockets or compartments to put things in separately though that goes out the window in a rush. I carry my wallet, my cell phone, and my Kindle. Always. Otherwise ... okay, I'm going into "strange person" territory here ... I carry little things to help in the event that I'm out and about and the zombie apocalypse starts. Example: a lighter (I don't smoke but you never know when you may need to start a fire or something), a small screwdriver, wrench and Allen wrench, floss ... Strangely, no FOOD now that I think about it. Chocolate should go in there. Maybe it just doesn't last very long. You know, if I ran into MacGyver, I'd be the go-to chick. Bookwoman: Travel???? Maybe it's just that we don't get out much. PK: Come the apocalypse, I want to be with you. Though you'd never get on a plane with most of that stuff. And yes, you need a bag of mixed nuts and Tic Tacs. Essential. Hallie, I love the Baggallini's when I'm on vacation. I have one like the one in the picture, and it's so light and convenient. My only problem with it is that there isn't room to stash a book or my Kindle in it. Oh, and I buy the Baggallini's at T.J. Maxx, too. Such great prices on them. I yellow/gold purse that I'm carrying now that I'm very fond of, both color and material (a bit like parachute material, but sturdier). I'm not much of a purse-aholic. I just want one I can carry in winter, one in summer, and a couple of dress-up ones. My husband bought me a Coach purse one time, and it was lovely, but it just wasn't something that was a big thrill. Maybe if he'd put a book or a bookstore gift card in it. Hahaha! However, every once in a great while, I see a purse that speaks to me. I have a black clutch purse that simply would not let me leave the store without purchasing it. Hank, what a hoot about the water bottles. I'm making a concerted effort these days to keep junk out of my purse, but it's an uphill battle. And, then there's the lack of satisfaction in desperate searches for something to snack on when you keep your purse tidy. Ellen, there are some items of my mother's that I just can't seem to part with. I was just talking to a friend earlier today about a couple of dresses I need to get rid of that belonged to my mother. She suggested I cut some of the fabric off the dresses to use in picture frames for my daughter and my son, perhaps for wedding photos. Jack, thanks for the laugh about the wallets. Sometimes you guys are just really hard to buy for and seem to appreciate the practical gifts. My husband gets gloves every year, but he wouldn't take the care to pick out a good pair if I didn't do so. On the other hand, I don't think most women appreciate a practical gift as much. Oh, I meant to add that I acted like the Coach purse was a tremendous thrill, as I didn't want my husband to think that his efforts to give me something nice went unappreciated. I carried it for a long time, too. Oh, Hallie, you've hit my spot! I was brought up to coordinate my purse with what I wore. I have four great, large Coach bags for fall and winter (orange suede, black leather, and red leather—a wonderful gift from some even more wonderful friends!). My summer bag is a huge floral designed leather that reached out and grabbed me as I tried to walk past it—three times! All of these purses have two pockets near the top suitable for cell phone(s?) and a zippered pouch. The floral one even has a key leash. Usually, they're all full: reading and sun glasses, a makeup/medicine bag, iPhone, book or iPad, several pens, cough drops, tissues, highlighters, loose change, water bottle, receipts, keys, and grocery lists (I never seem to throw them away!). When I was a very young child my mother dressed me up to go to "town" shopping: starched dress, patent leather shoes, and best of all, a red patent leather shoulder bag. My aunt took me to the "dime store" for my own shopping. When she returned me to my mother, I sported a red patent leather bag on EACH shoulder! Mine has to be cross-body and have enough compartments to hold purse,phone, iPad etc and be light. I have a fabulous travel purse with non-slash fabric, non-cut handle, and all compartments have a claw lock. But I'm not good on purses. My mom used to change her purse with her outfit. I use one for six months before I decide I should change it. Msmstry: red patent leather, still my favorite ever. And I think I've seen that summer bag! I rarely change purses either, Rhys. I don't think of one as accessory to anything, just its own thing. A necessary evil. TJ Maxx has Baggalinis?? Guess where I'M going when I get off the computer!? This past August when I was on vacation, I was in a coffee shop with my niece. We put in our orders and then browsed in their gift shop. They had a lot of purses, including a backpack style Baggallini. I fell in love with it immediately, and almost purchased it. It was expensive, and I was going to justify the purchase by telling myself that it was a vacation souvenir. But part of my trip home would be on the train, and I already had enough things to try to transport back home with me. It would never fit in my suitcase, and I already had one very full purse with me. When I got home, I checked on line to see if I could order, at a lower price, the Baggallini model that I saw on vacation. The one I saw on vacation was five dollars CHEAPER. So I haven't bought one, and I really, really need a new backpack style purse. I'm checking out TJ Maxx ASAP! Actually, Deb, both of mine are from Marshalls... now that think about it. They come an go - so if you don't find one on one visit, go back in a few weeks an look again. Stock changes fast. Happy hunting! ANd yeah, another time I thought--what's so darned heavy? it was a ROLL OF QUARTERS. And I always think it would be such a good idea to change bags with outfits--but I never do. And when my Mom died I got all her purses. Loewe, Tumi, Bottega, Prada. Thanks, mamacita. AND my grandmothers white gloves, still in tissue paper. WHAT ON EARTH??? DId you get a "choose all the whatever" photos for our captcha? I had to click on all the photos of steak. Biz-AAh. I'm a one purse for winter, one for summer person. I've tried the small uber practical with all the compartments, and the ergonomic cross-body ones, and even once (shudder to admit) a fanny pack. They all ended up at the bottom of the closet. So I get one big enough to hold my wallet, make-up bag, phone, and a book or a tablet, or extra things when I'm traveling. This winter I treated myself to a Fossil, lovely sort of burgundy/aubergine color. Two phone pockets, outside key pocket, inside tablet pocket, and the top zips. That's a must, because you can't travel with a handbag that falls open. Favorite color for winter--something in the purple range. Summer, lime green. And if I don't match, too bad. Love the Gillian Flynn stories. I'm flying to Ft. Myers, FL, tomorrow to speak at a luncheon on Monday, and am contemplating how not to look embarrassingly "wintery." But I'm not getting the summer clothes out of storage!! How come I'm not getting steak? ?